Pregnancy is a dangerous period for both the mother and foetus. Being born too early (preterm birth) is the leading cause of death and disease in children <5 years of age, while insufficient uterine contractions during or after labour can lead to major obstetric complications, including failed labour, requiring delivery by caesarean section, or major blood loss after birth (postpartum haemorrhage), which is the leading cause of maternal death worldwide. These serious complications are often attributable to abnormal regulation of uterine contractility. Fig. 1. 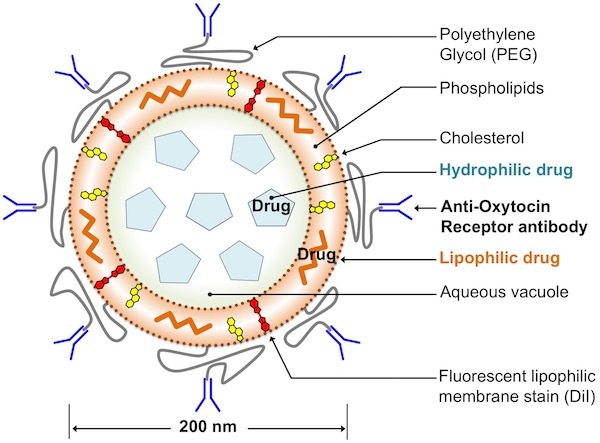 Schematic of targeted liposome structure. Unfortunately, the ability to provide safe and effective clinical therapy during major obstetric complications is hampered by the toxicity of therapeutic agents. Agents administered to block or enhance uterine contractions also affect other tissues, as such, the lack of specificity of these agents leads to adverse side effects in the mother and foetus. Development of novel strategies to target therapeutic agents specifically to uterine muscle would improve the effectiveness of current treatments while simultaneously minimising the risk of side effects. Liposomes are nano-scale vesicles (spheres) comprised of non-toxic organic lipids. These small spheres can encapsulate drugs with a broad range of properties, making liposomes versatile drug carriers. Furthermore, liposomes can be modified so that they recognise specific cell surface markers. These ‘targeted liposomes’ have emerged as a reliable and versatile platform for achieving targeted drug delivery to specific cell types, tissues or organs. Our objective was to develop a targeted drug delivery system for the uterus, which could be utilised to more safely administer therapeutic interventions during pregnancy. To do this, we coated liposomes with an antibody that specifically recognises the oxytocin receptor, which, during pregnancy is expressed at high levels almost exclusively on the surface of uterine muscle cells (Fig. 1). We then examined the ability of oxytocin receptor-targeted liposomes to deliver contraction-blocking or contraction-enhancing agents to strips of contracting myometrial tissue in vitro (human and mouse). We evaluated the ability of oxytocin receptor-targeted liposomes to accumulate (target) in the uterine tissue of live pregnant mice, and assessed whether targeted liposomes loaded with indomethacin (an anti-inflammatory agent) can prevent inflammation-induced (LPS) preterm birth in mice. Fig. 2. Uterine targeting and prevention of preterm birth. (A) Non-targeted liposomes localised only to the liver whereas oxytocin receptor-targeted liposomes strongly localised to the uterine tissue, in addition to the liver. (B) Oxytocin receptor-targeted liposomes loaded with indomethacin significantly reduced rates of LPS-induced preterm birth whereas non-targeted and drug-free liposomes had no effect. Oxytocin receptor-targeted liposomes loaded with contraction-blocking agents successfully abolished human myometrial contractions in vitro, while oxytocin receptor-targeted liposomes loaded with contraction-enhancing agents successfully increased the duration of contractions. Non-targeted control liposomes loaded with these agents had no effect. Similar results were observed in mouse uterine strips. Upon being injected into pregnant mice, non-targeted liposomes localised only to the liver, which is the site of clearance from the blood stream. Oxytocin receptor-targeted liposomes, however, strongly localised to the uterine tissue, and exhibited low-level localisation to mammary tissue. Targeting of liposomes the oxytocin receptor increased uterine localisation 7-fold. Importantly, localisation of targeted liposomes was not detected in the maternal brain, heart, kidney or lungs, nor within the foetuses (Fig. 2). When applied to a mouse model of preterm birth, oxytocin receptor-targeted liposomes loaded with indomethacin were effective in reducing preterm birth rates from 67% down to 18%. Non-targeted and control liposomes however had no effect. Our findings demonstrate that oxytocin receptor-targeted liposomes are a novel drug delivery system for the uterus. Through specifically recognising the oxytocin receptor, our targeted liposomes accumulate in the pregnant uterus where they successfully deliver either contraction-blocking or contraction-enhancing therapeutic agents. This approach has already proven effective in preventing preterm birth in mice. This world first targeted drug delivery system for the uterus has the potential to increase the effectiveness of current clinical therapeutics, while simultaneously improving safety for the mother and foetus. Drug delivery to the human and mouse uterus using immunoliposomes targeted to the oxytocin receptor.